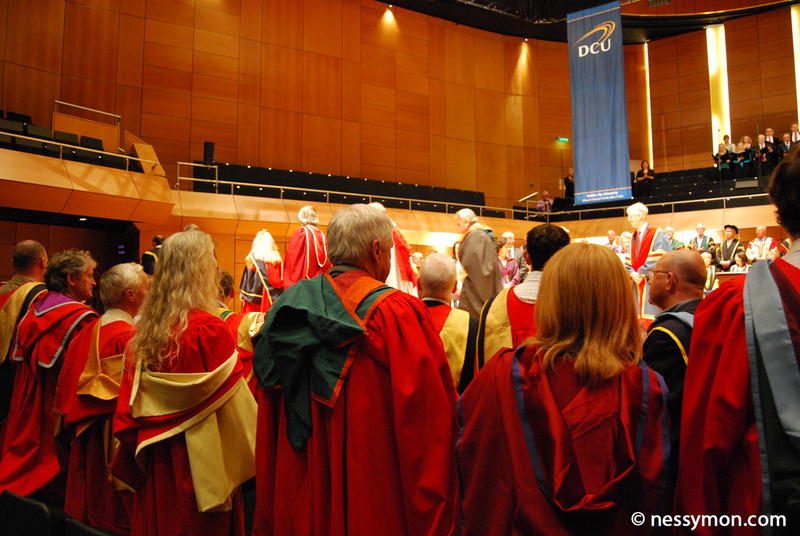 Yesterday I had the honour of attending the Inauguration of DCU’s third President, Brian MacCraith. Held in the Helix, it was quite ritualistic at times but for those involved in the actual ceremony itself, it seemed quite emotional. Professor MacCraith takes over from Professor Ferdinand Von Prondzynski after his ten year tenure as DCU’s President. Proceedings kicked off a procession of DCU’s academic’s in their full flowing robes accompanied by some music composed by Shaun Davey, with a solo by Liam O’Flynn, which we were then told was commissioned to be DCU’s new anthem. MC for the day was Deputy President, Professor P Anne Scott. Students from different ethnic backgrounds joined with the University Chaplins for prayer. There were touching words by Professor Von Prondzynski about his last ten years in DCU and also celebrating his silver wedding anniversary. Until yesterday, I didn’t even know DCU had a choir, they did stirring rendition of ‘You’ll Never Walk Alone’. Various people from within the university welcomed Professor MacCraith to his new post. He’s no stranger to DCU and has been working there previously. The installation of the new Presidential comes in two parts really, firstly the outgoing President removes the Presidential robes and returns to wearing the robes colour coded for his discipline. Then the Chancellor of the University, helps robe the Incoming President with the black and gold Presidential robes. 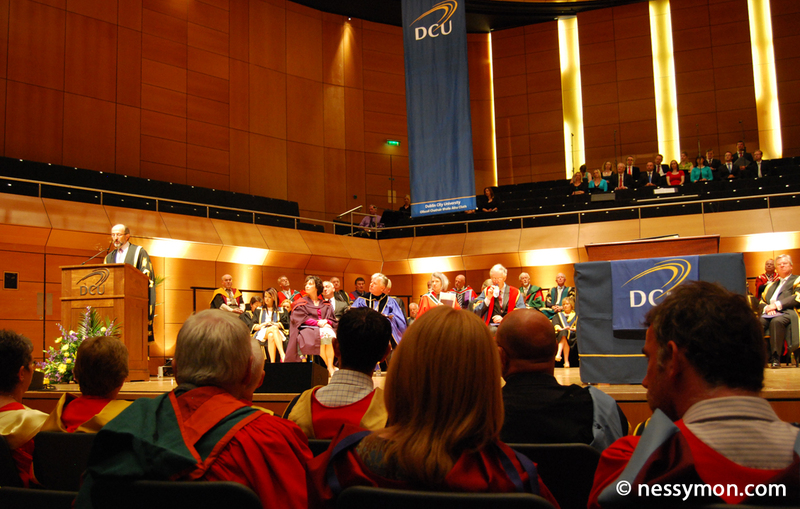 The second part is where new President signs the role of DCU University Presidents. 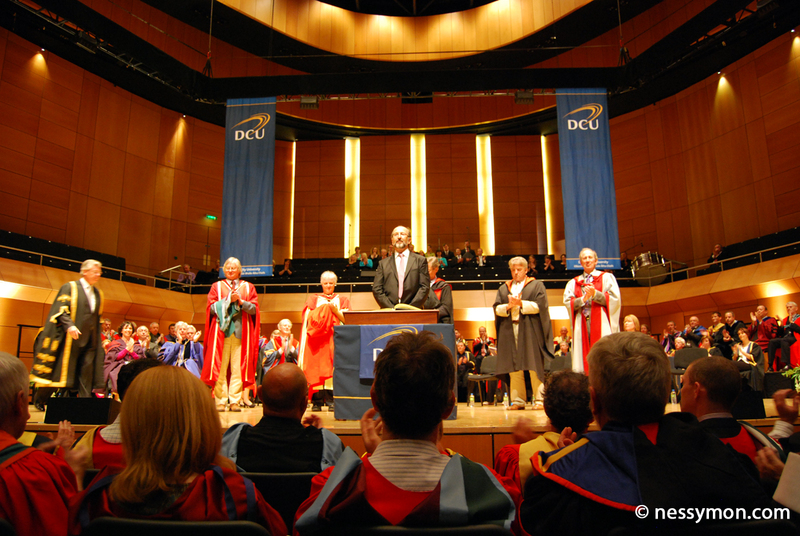 Professor MacCraith inaugural speech looked at how DCU must move forward and, what I was really impressed with, from next academic year, one Nobel laureate will visit DCU and give a public speech in the Helix. This will become an annual event. Really nice event, I’m glad I was there. Yes, all the robes did remind me of Hogwarts, except yesterday was full of colourful robes and there wasn’t a broomstick in sight.